Warrior effort and we slayed it…..
That is an absolutely corny title, but it is really fitting when it we talk about Masters 2018. On the diamond, the results were mixed (although mostly fun), however off the diamond it was the effort of some of the teams that we played (or not) that really was where we won! 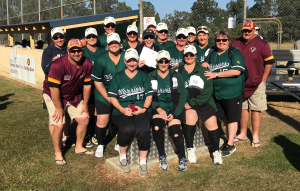 For starters, the team that started it all, all those years ago when we first wandered in to the world of Masters, the Toowoomba Warriors. We played against them that year (2010) and it was an absolute hoot. Playing Masters, we knew then, would be fun. That year and every year since, the team have donated to our charity, instead of buying trinkets for the other teams. A novel and fantastic idea. We know that when we see Deb and her teammates walking over to us that they will be incredibly generous. But today!? WOW is really all that can be said. 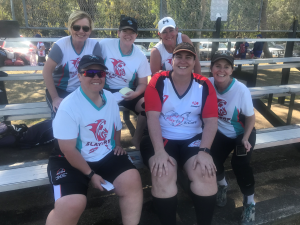 The Toowoomba crew pulled out all stops to get the following sponsors on board and again donated themselves to donate to us…….wait for it………….. $1800! Our most wonderful ongoing sponsor Carrie Rose from Rosie’s Early Learning again donated $500, as well as walking the park, shaking the pan AND playing for our team. That also contributed in many ways to raising such a good amount this weekend. Thank you so much Carrie. Slayers from Sydney were amazing, many of the team contributed their own individual donations amounting to over $300. Lovely ladies and all (well most) from the perfect Northern Beaches. A little bit of reminiscing occurred when meeting them today for the first time. Thank you so much ladies. We hope you enjoyed your weekend. Lastly to those that simply put in their loose coin and to those that tried guessing the gumballs (to see the list of winner, click here), we thank you. The total raised for the weekend is $3495.53. All of this will go to cancer research so although we didn’t win the gold, the charity really did win! Another year over, when I am sure there are many tired and sore bodies having an early night. Thanks again to those that support us, thanks to those in our team, especially those that travelled long distances, and hopefully we get to do it all again next year. This entry was posted on Sunday, August 5th, 2018 at 8:09 pm and is filed under Events, News. You can follow any responses to this entry through the RSS 2.0 feed. You can leave a response, or trackback from your own site.